"To thine own self be true and it must follow, as the night the day, thou canst then not be false to any man." End of discussion? Not quite! Four hundred years after his death, Shakespeare's words in Hamlet resonate with clarity, as we prepare to give assent to another human being who will occupy the Oval Office and be representing our moral vision for this nation. Needless to say, in this land of 320 million people, the lack of a satisfactory choice signals the deep flaws now rooted in our electoral process. The famous Veritas label shortened a century ago as Harvard's mission, from Veritas Cristo et Ecclesiae, has devolved in this age of moral relativism to being now depicted satirically as Veritas?. Senator Elizabeth Warren, Harvard Law School's pseudo-Cherokee import from Oklahoma, best exemplifies why the motto should once and for all be removed from within Harvard's famous ivy-covered walls. Veritas is now antithetical to their self-serving secular fundamentalist pursuits. While certainly not without peer, Warren "truly" represents a living lie. Her nickname, Fauxchahontas,, while coined in jest, paradoxically does ring "true." This multi-millionaire, ensconced in a Victorian mansion in Cambridge, the sanctuary city which nurtured the Tsarnaev family's hatred for us, had been show-cased by the mass media as both Presidential and VP timber. Her gesticulations, coupled with that shrill voice, cover the banal pronouncements reciting her aims for this nation. Unresponsive to the totality of her Massachusetts constituency, especially anyone with traditionalist or right to life values, the woman is now cast by her promoters in the media as some sort of Gendercure – a new wonder drug. Representative government these days is a myth. The medium is more than the message. The media are the ruling force. Now wordsmiths shape the issues – truth be damned. The only undisputed part of the message of William Shakespeare is that the night still follows the day. The integrity of the long-awaited "Comey Caucus," which was expected to report all the wrongdoing and criminal acts of one Hillary Rodham Clinton fell flat. In fact, it was farcical. 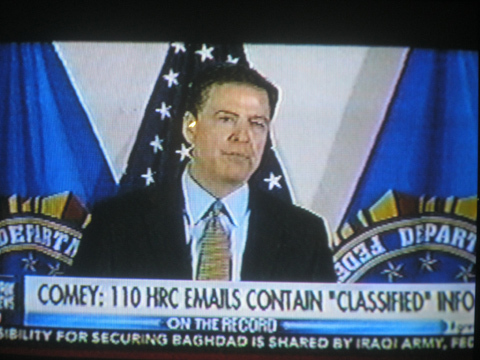 The FBI Director, while stating that she was "extremely careless" laid out all the reasons why Hillary should be criminally prosecuted, itemized them, and then refused to recommend to AG Loretta Lynch that Hillary be brought to answer before a legal tribunal. All this occurred after husband Bill Clinton, who as President had appointed Lynch to the Justice Department, had a private meeting with her on a tarmac setting. How serendipity that their two aircraft just happened to be in proximity to each other and they were able to have a cozy private chat! The Attorney General's revelation that their words were mostly about Bill's golf game and grandchildren was designed to re-assure us that we are in safe hands. In a world so full of tenuous and deadly situations, the woman who certainly does not seem to have the physique of a golfer and doesn't even have any children – let alone grandchildren – chatted about these topics? Lo and behold the news media reported her story dutifully and continued to treat the voting public as having a kindergarten mentality. Sadly, they were right. The Rev. Franklin Graham, travelling to each of these United States called us "morally bankrupt," adding "Christians must stand up against it." In Massachusetts "Where it all began," the pall hanging over us is even gloomier. 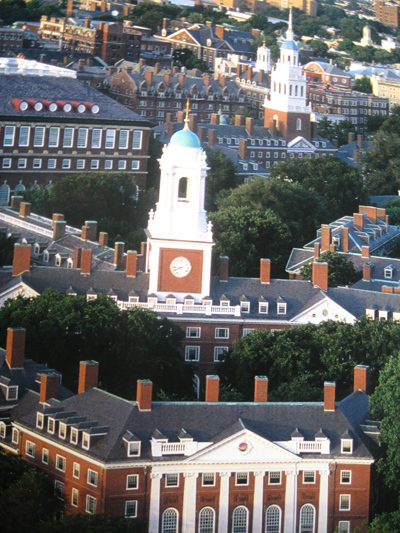 Although the 45th President of the U.S. will not be the 9th graduate of Harvard to assume the highest office in the land, Boston's Axis of Evil is aiming to have their hands still on the tiller after Nov. 8, 2016. This cabal expects that person to be Hillary Rodham Clinton, and she is a perfect copy of what is produced from their mold. And they are actively involved in pursuing that end. With the Oval office firmly fixed in the sights of this group, the Supreme Court is even a much greater prize. Its DNA, which for decades has been scientifically constructed by this devious group, will be genetically enhanced for many more decades. These 9 members of the nation's highest legal tribunal are appointed to serve for their lifetime. That alone should scare everyone. The members of the Harvard Law faculty most featured recently have been from two seemingly different backgrounds. Elizabeth Warren, whose husband was also appointed to the Law school faculty, was raised in Oklahoma, while Alan Dershowitz was reared in a heavily Jewish section of Brooklyn, N.Y. For years never at a loss in getting press coverage, he made himself less visible after the role he had in getting O.J. Simpson to go free having been on trial for his wife's murder. Two years ago Alan Dershowitz relished having his roots featured on the PBS program by fellow Harvard professor Henry Louis Gates. The narrowmindedness and flip-flops of his legal thinking may be explained by a youthful background which never brought him into contact with the goyim until early adolescence. As with so many who reverted to that known as liberalism, there seems to be a simmering resentment that they were granted such opportunities in this society. He seems to know that he ascended far higher than what should have been accorded him. His Leftist views on American issues do a 180-degree turn when it comes to Zionism. On Israel, he is completely a hawk. Henry Gates is the man who was arrested at his home by Cambridge police Sgt. James Crowley on July 16, 2009 after the officer responded to a call about a possible break-in. Gates had become boisterous and accusatory about racism being involved. Police charges were eventually dropped, but the issue went worldwide on the newswires. Lo and behold, President Barach Obama weighed in with a comment to the press. He prefaced it by saying "I don't know, not being there and not knowing the facts," and then he proceeded to follow up by saying "the Cambridge police acted stupidly." For one who once taught Law in Chicago, he legally fell flat on his face, so his damage control team went into rapid action. Obama called for a "beer summit" on July 24 at the White House, and he invited his old friend, Henry Gates and Sgt. Crowley, both of whom accepted. It was strictly for public consumption and to paper over a distorted situation which had no racial implications to start with – as well as the real "stupidity" of a U.S. President with his statement. Although Sgt. Crowley rose above the entire incident professionally, the media put the expected spin to the entire story. The New York Times quoted Gates on the White House meeting as saying that the Chief Executive was great, as well as "very wise," "very sage" and "very Solomonic." In 2016 Elizabeth Warren, elevated to Presidential timber, had also been mentioned as the running mate for Hillary Clinton. The feminist element was leaping with glee. Instead, nominee Clinton selected a "personally opposed, but – on abortion" professed Roman Catholic Sen. Tim Kaine – to give the ticket more political balance. 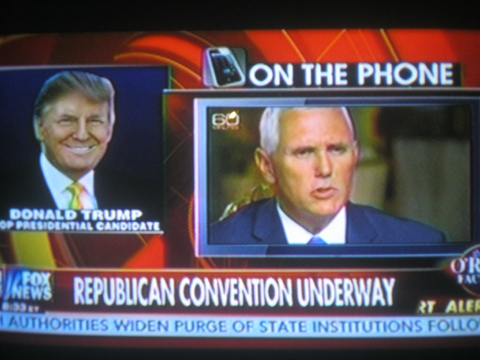 In their only debate, he was clearly outmatched by a considerably more composed and Presidential-appearing Gov.Mike Pence. Kaine was very well scripted in his "pro-choice' position which avoids the undeniable humanity of the pre-born child, and focuses on the decision of the mother – irrespective of who is destroyed. Pence explained his faith principles and defense of all human life, also stressing the need for the U.S. to follow the lead work done in Indiana in supporting adoption. He was the clear winner. Elizabeth Warren will never be far from sight as the election approaches, however, and her shrill voice will be stressing the same worn-out themes, the latest of which is transgender rights. Alan Dershowitz was interviewed by a snickering Megyn Kelly on Fox News recently on his new book, "Electile Dysfunction," a title which is supposed to be clever, but which really tells us much about him. He even had a Fox appearance on Martha's Vineyard for the satirical Watters World, while Obama was there on his annual golf vacation. The public is supposed to respect these individuals who are greatly responsible for the dire condition this once-proud nation now finds itself. To be respected, one must be respectable – and they are far from. Not one of these Harvard Law professors has ever publicly called for the Harvard records of our current President to be unsealed – to examine whether he attended there as a foreign student. Obama's birthplace may or may not be an issue, but his years in Indonesia as Barry Soetoro certainly are. He was actually a citizen of Indonesia, and then returned to Hawaii after his mother's divorce. The candidate of the Democrat(ic) Party who led throughout the primaries was Hillary Clinton, and she did so on the basis of the overwhelming number of votes provided by the SUPERdelegates. They held these votes by virtue of positions in the party. In effect, this system provided her with a ruling House of Lords, while only going through the motions of it being a "democratic" process. Donald Trump gained impetus by first exposing and accenting gaping holes that are making a mockery of our constitutional structure. The most visible societal change has been the influx of millions of illegal aliens through a porous southern border with Mexico. He minced no words in pointing out the number and types of felonies being committed by these illegal aliens. These criminal acts, and the obvious involvement in maintaining the status quo by business and industry – in cahoots with many politicians – proved to be fertile ground. Although there were many others among the 17 aspirants to the GOP crown who actually had solid credentials and office holding executive experience, Trump's positions about securing the borders resonated. The horrible murder of Kate Steinle by a felon deported many times was one such instance which caused many to overlook much about Donald Trump's personal unlikability. He also put great stress on our enormous debt and the weak economy. While many were turned off by his insults and demeaning language to and about his competitors, the geography and timing of the primaries gained Trump the GOP nomination. From his victory in home state N.Y., it was basically clear sailing. His personal wealth financed his nomination quest, and a seemingly "take-no – prisoners" style actually served to co-opt the media attention, as each media outlet sought to dominate the ratings. To the surprise of the punditry and ideologues alike, it was the Evangelical Protestant element, in the wake of the Obama administration's attacks on religious freedom, that swept the thrice-married, dollar and security-oriented candidate, to key-state victories and the prize. GOP primary voters seemed to overlook the slash-and-burn approach of the winner, and this country was given two of the least admirable personalities ever presented to lead this constitutional republic. After the many months of speculation and reported leaks that over 100 FBI agents were conducting an extensive investigation of Hillary Clinton's use of a personal email server to conduct State Department affairs, FBI Director Comey's failure to recommend legal action was more than shocking. The public trust had been dealt a severe blow, as the FBI may have been the last agency that was felt to be independent. The citizenry had to see now that a fix had been in the works all along. Our Founding Fathers were intent on having two major principles built into this form of constitutional government: the separation of the 3 branches, and a built-in system of checks and balances for each one relative to the other. The two major principles seem to have been totally dismantled in recent decades, as the moving parts in the machine such as the FBI have been sabotaged. The mass media, once known as the 4th Estate in keeping a watchful eye on the 3 branches for the people, is owned by powerful blocs which have turned reporting into omission, distortion – and a total promotion of their desired aims. Objectivity has long since been cast asunder. Every voter true to him or herself must step back, objectively view the political scene, and with a clear head seek the truth. Yes, Veritas. We are a nation based on a written Constitution, the greatest governmental document ever put into words. Above and beyond this fact, it and our Declaration of Independence were based on Judeo-Christian moral values. They have and still are being subjected to a severe bombardment by well-organized secular fundamentalist forces. November 8, 2016 is of such importance, it cannot be over-estimated. The Democrat nominee Hillary Clinton has had a lower bar set for her from the start. The media, in reality a Clinton SuperPAC, knew well that the Clinton machine would be burying a host of political IED's on the road the Trump forces must travel. Being in control of the media, they also have remote timing devices for them. From the Kahn family to Miss Universe winners to Trump locker room talk, they expect reactions – and they know it is poisonous when Donald Trump attempts any defense. The 1st debate on Sept 26 "moderated" by Lester Holt glaringly displayed the collusion between the Clinton Democrat machine and the media. His questions, which avoided Benghazi, ISIS, the Clinton Foundation, the email personal server, religious liberty and a host of vital issues, blatantly revealed this collusion. The questions were obviously given to him in advance by her handlers. She was so well rehearsed in them, it brought one back to the famous Candy Crowley fiasco when she professed to have had no previous interchange with the Obama machine, as she "moderated" an Obama- Romney debate. The concept of democracy is a beautiful ideal. From its Grecian origins, it is rooted in rational thought and public expression. In our Judeo-Christian framework, it is a belief in a pursuit in goodness – and in John Adams' words made for "a moral and religious people." In this nation of laws, not men, we are told also to be "eternally vigilant," and its need has never been more evident. The Founders knew that a pure democracy was impossible. And that is why the United States is a constitutional republic. There is a clarion call in 2016 to muster countless people, who deem themselves religious but who have unknowingly embraced secularism. It has been paraded under a multitude of names, and with liberalism having been tarnished, proponents have embraced the old label of Progressivism. This label is now very much in vogue, and is even being used to embrace legalized abortion. Unwittingly, this recent appellation reveals the inverse core of their beliefs. The act of killing a child in-utero or ex-utero is REgressive, not PROgressive , and should cause us to reflect even more on how we have regressed to the barbarian practices of past "civilizations." We can never diminish our efforts to restore respect for all human life – from conception to natural death. Unfortunately, during this campaign only GOP VP candidate Gov. Mike Pence is the solitary candidate to unabashedly make this point. We are clearly in a post-Christian era, now over a half-century in the making. The irony is that it has accelerated after our successful historical moral victories over Fascism and Communism. Older Americans have difficulty as they view the decline in the virtues which prevailed in bringing this nation to victory over these Godless philosophies. In 1945 we proved to the world the superiority of our beliefs – in stark contrast to our current place in the world. Pointing out and stressing this theme to voters, as contrasted to where the Obama-Clinton leadership has taken us, has been another major reason for Donald Trump's victory in the primaries. The entire electorate must grasp this glaring fact. Despite the intermediary forces at play through the filtering and spinning by an uber-powerful media, we are still free. In fact, we should never even think of capitulating, and it cannot ever be forgotten that on Nov. 8 we are making a moral choice – while neither Presidential candidate is far from being our ideal. However, a vote is never to be discarded. The vote we cast is a proxy. However miniscule in terms of all the votes to be cast, we are making a moral choice of immense proportions. Voting is ostensibly for candidates, but in reality it is all about issues and their stand on them. Of vital importance, however, is that these issues are of different weight. This is the one aspect that overrides everything involved in the process. The weight each carries can NEVER be forgottten. The secular fundamentalists, often using consumerism as their tool, direct your focus on the "me." Their goal, however, is to pre-empt the middle ground, as that is where elections are won. Hunger, disease, poverty and overpopulation are starters, while adding child neglect, racism, xenophobia, and sexism to provide a wide sweep. The starters, of course, have a life-and- death element, but nowhere do they specify abortion, which is the direct and intentional taking of a human life. It is at this point that they veer off and deploy carefully-selected euphemistic terminology such as "women's reproductive health issues." In any line-up of issues, however, the ones which involve the loss of human life are pre-emptive, but this is where those who see the line-up as a "seamless garment," are ignoring the most important dimension. They choose to ignore the weighting process entirely by equating the POSSIBLE loss of human life with the INTENTIONAL termination of a human being. This is a glaring fallacy and intellectually dishonest. The intentional stopping of a million human hearts annually, sanctioned and financed by the federal government -with our money- is actually being done with voter's approval. As we cast our votes, this has to be foremost in our minds. The U.S. Constitution's tri-partite form of government devotes the fewest number of words to the judicial branch. The intent was to clearly define its role, while restricting the court from assuming powers previously defined for the other branches. Back in 1803 the Supreme Court assigned to itself the power of Judicial Review, which has since led to judicial activism, and the Court has become another legislative branch. This has been devastating to our way of life and has to be ended. Roe v Wade and Obergefell v Hodges are two current decisions which arose from this assumed power. Abortion and marriage were never mentioned in this great governing document, and these decisions were handed down as a way to attain the secularists' goals by their interpretation and manipulation of words. 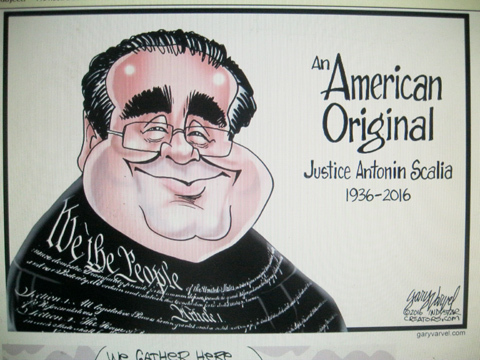 The untimely death on Feb 13th of Supreme Court Justice Antonin Scalia is the greatest tragedy to befall this nation in 2016. It has left a gaping hole in our government functioning, as he was of the "original intent" approach to deciding cases. The Left believes in a "living constitution," which allows elasticity and the high court to become this alternate legislative body. The greatest number of words were devoted to the role of Congress as the law-making body by the Founding Fathers in their wisdom, and this assumption of power by the Judiciary is an abomination. In view of the fact that constitutionally the President nominates replacement justices, the filling of the vacancy in the seat held by Justice Scalia is pending. Hillary Clinton or Donald Trump will be performing this extremely important act. In addition, however, during this next term there could be vacancies for 2 or 3 other currently sitting justices, given their ages and health. The submission of a nomination by President Obama, with another Harvard Law graduate who would insure the cabal's dominance, reveals a great deal about the thinking of the ruling element in this country. Obama placed Derrick Garland in nomination in an attempt to pre-empt his successor by filling the vacancy. Of course, the GOP leadership stopped him by refusing to allow a vote until after the Nov. 8 election. The Democrat objection to what they themselves have practiced in the past has been highly vocal – but not surprising. While placing the 6th Harvard Law graduate on the Court, hidden from view by the media was a glaring example of the sheer hypocrisy of the party which prides itself on pursuing and enshrining "diversity." Garland would be the 4th Jewish member of the Supreme Court of 9 justices. So much for diversity with the high court lacking a Southern Baptist, or one professing Evangelical Protestantism. Judicial philosophy, of course, should be the one and only consideration, but this attempt once again reveals much about this ruling power bloc and their hypocritical thinking. A Justice Garland would be a far cry from the originalism professed and exemplified by the man he would succeed. The Axis of Evil was never as blatant in their quest to bolster their power than it was later in the year on May 10 with an editorial in its bugle, the Boston Globe. 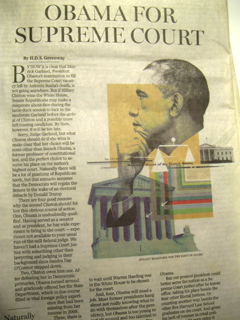 The headline in bold letters read OBAMA FOR SUPREME COURT. In it we were told, "Clinton owes him one." It goes on to state, "After defeating her in Democratic primaries, Obama turned around and graciously offered her the State Department,." It then proceeds to state "Obama is too young to just sit around and too talented to just be let go to waste." The best part, however, is the conclusion that he "could best serve the nation as a Supreme Court justice after he leaves office, taking his place beside the four other liberal justices." Not content with that, the editorial further states, "Or counting another way, beside the other five Harvard Law School graduates on the court." The hubris of this element is unequaled. The constitution in the Bill of Rights guaranteed us first the freedom of religion. These secularists are now trying to interpret this as only the freedom to worship. They are seeking to justify a change during the Obama tenure, until they can bar religious involvement totally. The deadlocked attempt to force the highly respected Little Sisters of the Poor to provide abortifacients, or suffer millions of dollars in fines which would end their existence. This was a blatant attempt toward this end. It cannot be stressed too often that 2016 is a crossroad that demands God-fearing people to recognize who makes up the power blocs. In this election all are clearly behind Hillary Clinton. From the Chamber of Commerce to Goldman Sachs across the spectrum to teachers unions, they have contributed many millions to her quest of the Presidency. 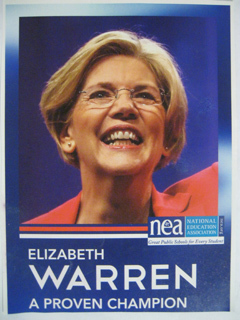 Teachers have been propagandized by the NEA through their "professional" publications for decades, backing liberal positions and candidates without exception. In 2016 it is even more of the same. They are staunchly opposed to "school choice." which is of enormous benefit to African-Americans in the inner cities. While they support "choice" when it comes to life itself, they oppose the concept when it comes to much needed education reform. Our conscience calls for us to make voting decisions within the framework of logical thought, rising above the incidents and scurrilous language which the media dwells on. While some of the language and conduct in everyday America is downright sickening, as one such recent live-mike taping of Donald Trump's "locker room talk" was demeaning and "macho." He did apologize, but the media dwelled on it without let-up, and we later learned that NBC had held the story for weeks to release it the weekend of the 2nd debate. It provided a total distraction from the very different positions the candidates hold. While not condoning his language, we still cannot get detoured from the issues of life and death. Words, however coarse, degrading and inexcusable, still are not equal to evil deeds. The acts of the Clintons, having amassed nearly a quarter-of-a-billion-dollar fortune for themselves with "pay to play" international dealings, are disqualifiers from any future position of public trust. A voter has to ask him or herself how they could command hundreds of thousands of dollars for a speech, let alone create a "charity" to cover the vast wealth and power they accumulated. And this influence peddling has been in clear view of the media. What ever happened to standards, ethics and age-old virtue? 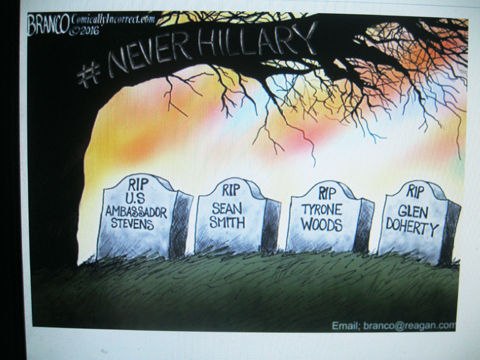 Add to this the disgraceful conduct of Hillary Clinton surrounding the deaths of 4 brave Americans at Benghazi, and we see a complete lack of character on her part. The public view of Hillary Clinton as "untrustworthy," which ranks highest in many polls, is not surprising. Our moral roots call for us to vote with the head, not the heart. It cannot be any other way with the deep, moral issues existing before us as we approach Nov. 8, 2016. Aligning all the issues, the defense of innocent human life ranks foremost, and with 60 million developing pre-born human beings having been legally killed since the Supreme Court's ruling in Roe v Wade, the make-up of the Court itself ranks first. Filling Supreme Court vacancies by the next President with nominees who would end this killing mandates that justices be in the Antonin Scalia mold. Candidate Donald Trump has submitted a list of names, approved by conservative groups such as the Heritage Foundation, and they have been roundly praised by "originalists." It has been rightly stated that Roe v Wade amended the Constitution in the guise of interpreting it. Roe was constructed out of whole cloth, and traditionalists see a chance to end the disgraceful American Holocaust of 60,000,000 innocent developing humans which resulted. The Democrat nominee, Hillary Clinton, who has publicly vowed to defend Roe v Wade "at all costs," must never be allowed to occupy the White House again. 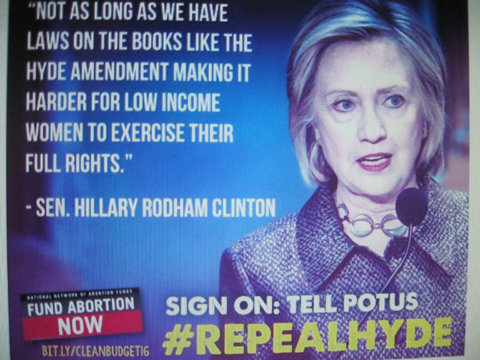 In April on Meet The Press Hillary made her views quite clear when she told Chuck Todd, "The unborn person doesn't have constitutional rights." There now is an all-out effort to rescind the 40-year-old Hyde amendment, which although subverted with fungible dollars, was passed to prevent our tax money directly to pay for the one million yearly abortions. Planned Parenthood plays a shell game, but they want to clear the board completely. Caught like a deer in the headlights in 2015 in their selling of baby parts, this is an attempt to divert attention from their Nazi-era atrocities. Their "women's health" guise is transparent, and this is very much in evidence with the secret taping by David Daleiden's Center For Medical Progress of their abortion doctors. The nauseating conversations about the dollar value of the organs they dissect in their work was no different than what could have been heard in World War II Germany. Hillary Clinton's lies about the Benghazi tragedy may rank above all the others during her tenure as Secretary of State. They were even told over the caskets of the victims to mothers, fathers and relatives of these brave heroes whose deaths resulted after more than 600 calls for assistance were made. The woman with the plastic, well-rehearsed expressions would be pitied were it not for what her dishonesty has left in her wake. She is an inveterate liar. It is clearly pathological, and she must be stopped. WikiLeaks revelations that President Obama actually did email Clinton on her personal server, while using a pseudonym, further muddies the water. The lying just kept getting worse by all parties. In addition to Justice Scalia, the Lord called home in 2016 another stalwart defender of the original intent of the authors of our founding documents – a lady without peer, Phyllis Schlafly. She was an eloquent defender of these principles, always standing her ground without compromise. As one who had an enormous part in maintaining the decades-old conservative and pro-life positions in the Republican platform, she had endorsed the candidacy of Donald Trump. The make-up of the Supreme Court was her prime consideration. One more admirable individual who has given his unqualified backing to Donald Trump is another who has never held public office, Dr. Ben Carson. He was once the early leader among the 17 GOP candidates, having been given great respect for how he rose from a poverty-ridden background to become a distinguished Johns Hopkins neurosurgeon. While at times the object of Donald Trump's scathing comments, as were all the aspirants to the GOP nomination, Dr. Carson nonetheless endorsed the extremely successful businessman. Raised by an illiterate mother, he states that she put pressure on her children to gain an education – and to use the bible as their moral base in seeking answers to problems. Dr. Carson is unapologetic in citing passages from the bible in approaching the lewd content of the 11-year-old open-mike tape, which the media and the Clinton campaign is attempting to make the pivotal issue in voting. In his continued denunciation of the media's distortion and misdirection from Benghazi, ISIS and all the death-dealing happenings in these recent years, Dr. Carson cites his Master's denunciation of the hypocritical men about to stone a woman caught in adultery. "Let he who is without sin, cast the first stone," are the words Dr. Ben Carson. We have to follow Shakespeare's admonition and be true to ourselves. All the issues are lined up before us – and the protection of Innocent human life carries infinitely more weight than all the others. It is clearly the pivotal one. Parallel to – and joined with it – the make-up of the nation's Supreme Court for decades hangs in the balance. We call for God's help! Our vote on Nov. 8 must be for the Trump/Pence ticket.